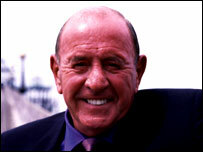 Former EastEnders actor Mike Reid has died at the age of 67 after suffering a suspected heart attack, his agent said. 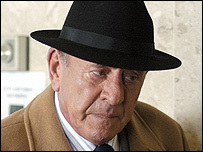 The actor, who played Frank Butcher in the BBC soap, was living in Spain at the time of his death. Reid became a stand-up comedian having worked as a stunt man. He went on to work in TV shows including Runaround, Doctor Who and Minder. His agent David Hahn told the BBC his death came as a great shock as he had been in very good health. He said: "Mike was in fine fettle. In fact only a couple of weeks ago we were having dinner over here. "Mike that particular day went to see his consultant and had a full medical - and they gave him a clean bill of health." Mr Hahn paid tribute to Reid, who he described as "a very, very, very, funny" man. He said: "He would see the funny side of any situation, no matter how black it was. Even now I'm sure he's laughing." Reid joined EastEnders in 1987, quickly turning Frank into one of the show's most popular characters. Actress Pam St Clement, who played Frank's wife Pat for many years, said: "It has come as a terrible shock - somebody larger than life as Mike was in person and character - he seemed indestructible." Reid made his last appearance as Frank Butcher in December 2005 when his long relationship with Pat finally came to an end. Actor Adam Woodyat, who plays Ian Beale, said Reid "used to brighten up long filming days keeping the cast and crew laughing". "He was a great man and our thoughts are with Shirley and his family," he said. John Yorke, controller of BBC drama series, said Frank's popularity was down to Reid's skill as an actor. "Mike's genius was to capture the heart of that flawed dreamer and make generations of viewers love him," he said. "Albert Square - and British television - will be a far poorer place without him, as will the lives of those who loved and worked with him throughout his extraordinary career." The actor and comedian rose to fame in 1973 when he landed a role as one of the original stars of ITV show The Comedians. Russ Abbot, who appeared alongside Reid on the show, told BBC News 24 his former co-star was a natural entertainer. "Mike was a story-teller and a great deliverer of great, great jokes," he said. Frank Carson, a close friend who met Reid around 30 years ago, told BBC News 24 the news was "absolutely devastating". "We have just lost our friend Bernard Manning a fortnight ago. I just can't realise... this is devastating news," he said. Another fellow comedian, Mike McCabe, said Reid had been "a jack-the-lad, very funny with a great cockney way of putting things together". "He was one of the lads. The blokes loved him, the women loved him. I admired the man," he said. Before entering the comedy scene, Reid began his career as a stunt man. He worked on films including Chitty Chitty Bang Bang, Those Magnificent Men In Their Flying Machines and Spartacus. He had also been a stunt double for Roger Moore in The Saint. "I know it's hard to believe - Mike was a lot taller than him, and often used to laugh about it," Mr Hahn said. In the late 1970s, Reid hosted the ITV children's TV quiz show Runaround, remembered for its incomprehensible rules and the incongruity of him as presenter.